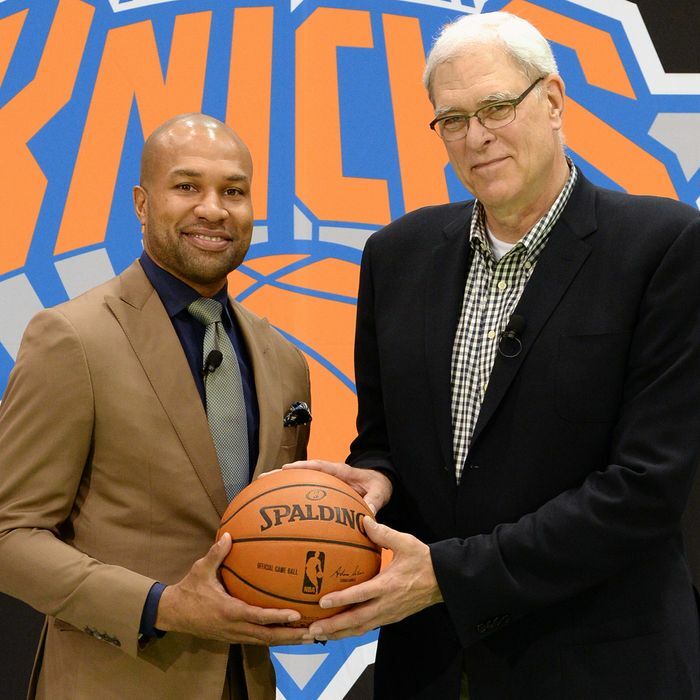 Derek Fisher and Phil Jackson. Phil Jackson had an unparalleled resume as an NBA coach: He won eleven titles with two different teams, three-peating on three separate occasions. He got the most out of some of the best players of all time, and was elected to the Hall of Fame even before winning his last two championships. There’s one knock, though, on an otherwise sterling career: His coaching tree — which is to say, the assistants and former players who went on to coaching careers of their own — is quite weak. Contrast that with some of the other great coaches of Jackson’s generation. Pat Riley can claim Jeff Van Gundy, Stan Van Gundy, Byron Scott, and Erik Spoelstra on his tree. And Gregg Popovich’s tree has Mike Brown, Doc Rivers, and Avery Johnson, plus a slew of executives, including Thunder general manager Sam Presti. But now that Jackson is in charge of the Knicks’ basketball operations, hiring Derek Fisher (and likely some other trusted friends as assistants) is his best, and perhaps final, shot at creating an impressive coaching tree of his own. It might even be part of the appeal for for Jackson, beyond the huge paycheck and the chance to revive the Knicks franchise. It would complete his legacy as a giant of the game. Jackson’s teams ran a complex system called the triangle offense, which isn’t easily passed down to assistants to take with them to other teams. Indeed, it disappeared from the NBA when Jackson’s tenure as Lakers coach ended. Since becoming Knicks president in March, Jackson had been looking for a young head coach whom he could mentor, and in particular, someone with whom he already had a relationship. Steve Kerr, who played for Jackson in Chicago and has experience as an executive and broadcaster but not as a coach, would have been a fit. But when Kerr took the Golden State job, Jackson set his sights on Fisher, an on-the-court leader during his playing career who won five titles with Jackson’s Lakers. Riley and Popovich have experience as executives, which allowed them further opportunities to establish branches on their coaching trees. Now, for the first time, Jackson has that chance as well. In his role as team president, Jackson has the freedom to define his role, and that could include occasional on-the-court instruction, like at training camp or at practices. Such a set-up wouldn’t work with a more experienced coach, but it’s perfect with someone as green as Fisher. He won’t just accept it; he’ll likely embrace it. That’s good for Fisher’s career (and for the Knicks’ chances), but it’s also good for Jackson, who can guide Fisher and his staff in a way he couldn’t guide former assistant coaches who took jobs with other teams. Jackson seems to be bringing together his protégés: Cartwright, Cleamons, and Rambis are all in the mix for jobs on Fisher’s staff, as is former Laker Luke Walton. If the Knicks succeed, it could even lead to other opportunities for them, and further chances for Jackson’s influence to spread. This could be Jackson’s last job in the NBA, which means it could also be his last chance to leave his mark on the next generation of coaches.